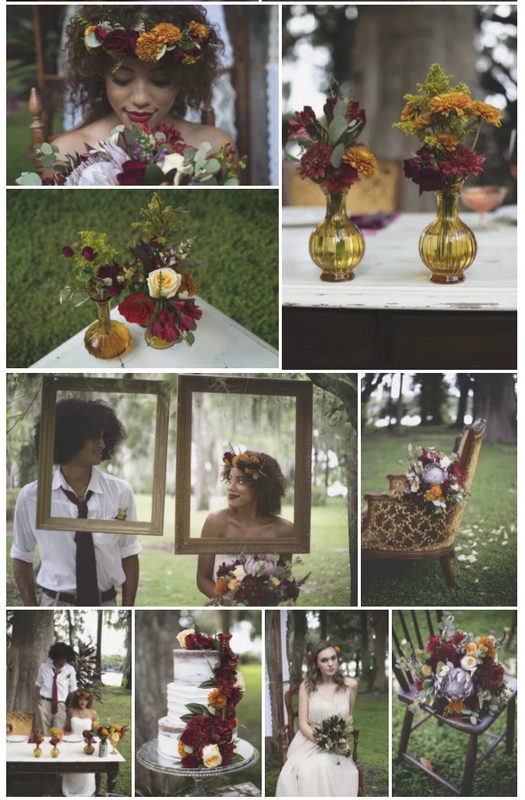 Here at Bluegrass Chic, we jump at the chance to use Autumn colors and when we got the call to do the floral for this bohemian, natural photo shoot all we could say was yes, yes, yes, yes! Taking inspiration from nature and all its lovely colors during this time, we chose rich flowers of deep burgundy, purple, and amber. Each floral piece had a mixture of greens and textures to really give you the feel that you picked the arrangements up from a meadow! Starting with proteas and ivory roses for the bridal bouquet, we incorporated the autumn colors using chrysanthemums, snapdragons, hypericum berries, and silver dollar eucalyptus. This photo shoot was such a pleasure to work on, but we have to acknowledge how beautiful this couple is! And not only did the bride want her bouquet, but we also made her a gorgeous flower crown of amber and burgundy mums that went perfectly with the grooms boutonniere. Everything came together "perfectly, unperfect" from the natural cascade of burgundy on the 3 tiered cake to the rustic bohemian bud vases for their centerpieces.